CCTV footage has captured the moment a ticked off motorbike owner confronted two thieves armed with nunchucks who were trying to steal his ride. 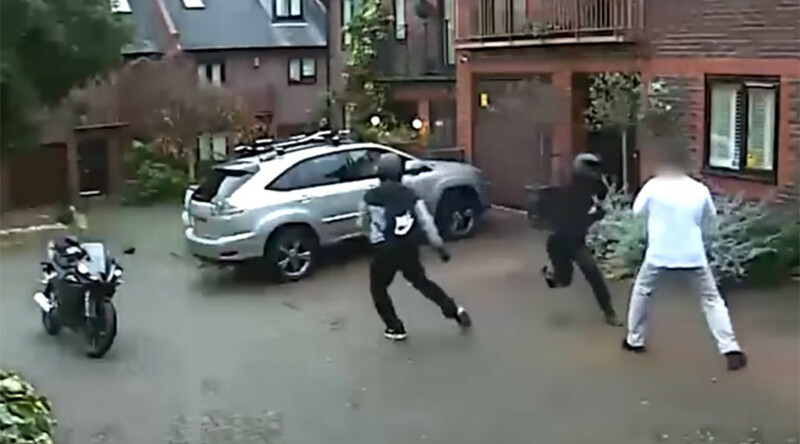 The unnamed man, 46, ran out of his home in Norbury, south London, to challenge the two thieves, whose faces were concealed by black crash helmets. In the video released by the Metropolitan Police, one of the suspects can be seen pulling out nunchucks and attacking the owner while his accomplice runs to his motorbike to steal it. The altercation took place at around 1:30pm local time on December 10 of last year. The Daily Mail reports CCTV footage shows the thugs riding up and down the street on a stolen motorcycle before choosing the bike to target. One then hopped off and used a screwdriver to try to steal a three-wheeled motorbike parked in the driveway. In footage released by police, one of the robbers can be seen repeatedly attacking the owner with nunchucks, injuring his hand. However, the owner manages to grab hold of them and push the would-be thief against a parked car, at which point two neighbors come out to help. Detective Constable Ania Casey, of Croydon CID, said: “If the owner had not locked his motorbike with a heavy chain, his bike may have been taken in seconds. “Those extra minutes were sufficient enough to alert the owner and his neighbors to deter the two suspects. Police are searching for the suspects, one of which was reportedly wearing a dark colored jacket with a red logo on the back, black trousers with a blue line down the side, black trainers with white soles, and gloves. The second suspect was reportedly wearing a dark jacket with grey at the top, dark trousers, black trainers with white soles, and a helmet with a Nike swish on the back.